What trainers give certain gifts in the Big stadium and small court in nimbasa city? 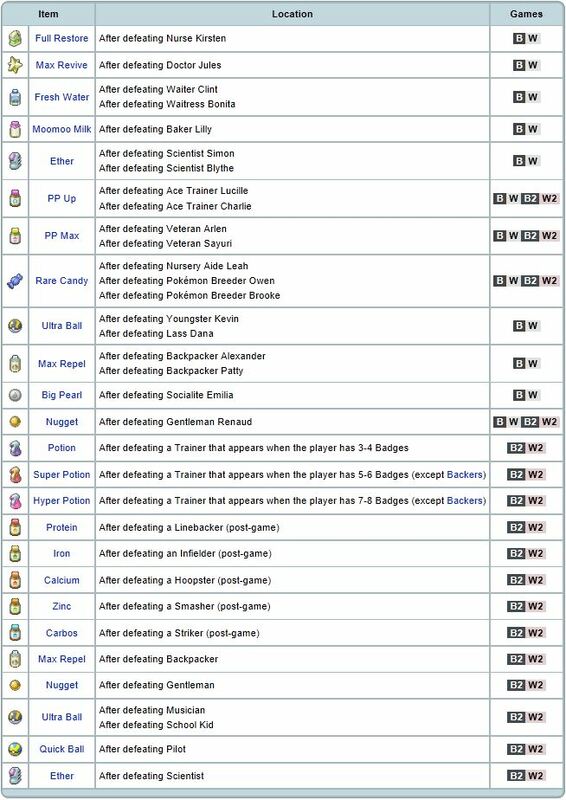 Please name all the gifts and name the trainers who gives you those gifts after battling them.What I mean is,when you battle a veteran,he gives you a gift like PP Up.Like that please name all the trainers and what gifts they give you after battling them. Can you re-battle the Trainers in the Nimbasa City Sports Domes? Which city in Unova has the highest population, Nimbasa city or Castelia city ? In Pokemon Black 2 why aren't the trainers in the Big Stadium and Small Courts changing daily? What do the judge's words mean, and what are all the possible words he can say?